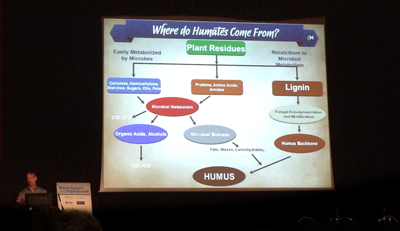 Horizon-Ag Products’ Senior Research Chemist Dr. Richard Lamar presented “Why Humic Acids Don’t Work” to a large contingent of scientists, researchers, and business development attendees at the 2015 Biostimulants and Plant Growth Conference in Brussels, Belgium. Dr. Lamar’s May 20th presentation explained the vast differences between humic acids, a powerful and complex organic biostimulant that has demonstrated efficacy in nutrient solubility and uptake, combating abiotic stress, water efficiency , and ultimately, increased yield. Dr. Lamar shared Horizon’s expertise on humic acids, discussing the different origins of humic acids, humic acids chemistry, quantitation methods, variability factors in ore sources, dosages, and selecting the right dry and liquid humic acids products for commercial applications. For over 30 years, Horizon Ag-Products has enabled producers to maximize efficiencies of their agricultural products using Horizon’s select sources of humic-based substances. Our continual commitment to research and development has furthered humic science, allowing Horizon to develop innovative plant health solutions that improve the health and vitality of soils, while increasing crop quality and yields. Horizon Ag-Products and Dr. Lamar will be presenting a follow-up at the Crops and Chemicals Conference on July 23 in Raleigh, North Carolina.